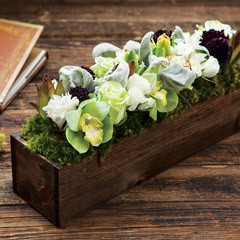 Gracefully evoking a feeling of serenity, a simple gathering of delicate white flowers accented with deep eggplant, vivid chartreuse, and soft silver is displayed in a dark stained hand crafted wood trough. 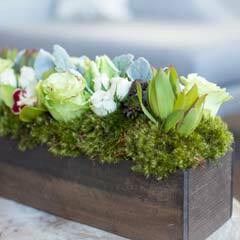 Bianca Grace measures approximately 15" x 4" x 8" to top of arrangement and requires next day shipping. 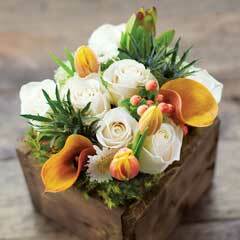 Bianca Grace is a fresh cut floral arrangement. Bianca Grace is rated 4.7 out of 5 by 143. Rated 5 out of 5 by Flightmoe767 from Beautiful! 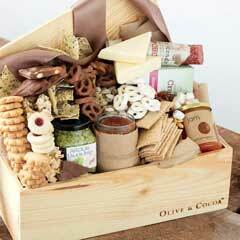 This was a hostess gift and she loved it! I would definitely send a Bianca grace again! Rated 2 out of 5 by KcMc from Pretty but disappointed Sent to my Sister for her birthday and I was disappointed. There was one very sad orchid in the arrangement. I chose it because it had orchids. Rated 5 out of 5 by PK2018 from Beautiful and so fresh! 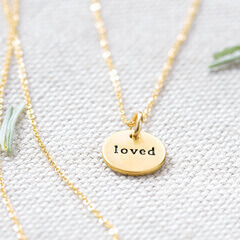 I bought this for clients- and they were thrilled! Rated 5 out of 5 by SusanA from Wonderful gift! I sent this as a gift and was told it was wonderful! Rated 5 out of 5 by PJBrown from Stunning and elegant Recently purchased as a birthday gift for a dear friend. 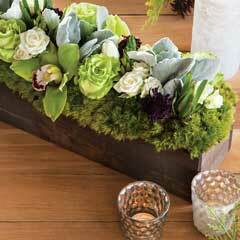 She was delighted and said it was such a beautiful complement to her home.